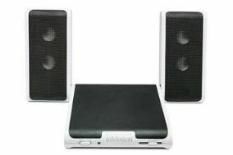 Altec Lansing InMotion IM4 review | What Hi-Fi? This is a more compact system than most, but it's very capable. The speakers fold away for neat storage, but the sonic presentation is anything but slimline. Detail, bass definition, expressive midrange, and sweet treble are all there, and with an iPod sat on top of the kit, it looks good, too. It won't blast your barbecue with sound, but it will provide ample, good quality sonics for smaller picnics and the like.